This was a concept build. 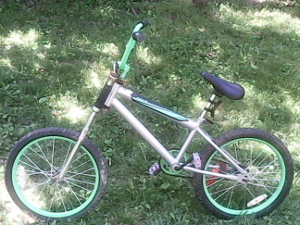 2017 Huffy RockIt Bike with a Huffy chopper fork. It's about to be torn down and have a stock fork installed. The Huffy RockIt's only shortcoming is it's crank. This could be a practical bike if only the bottom bracket shell would accommodate an American 1 piece crank. Theoretically... a PF30 crankset would fit, but that upgrade would end up costing triple the price of the bike new. I *might* try and get some more pictures of it before the tear down. Maybe I can put a proper banana seat on it. I forgot to take pictures before building it back to stock.